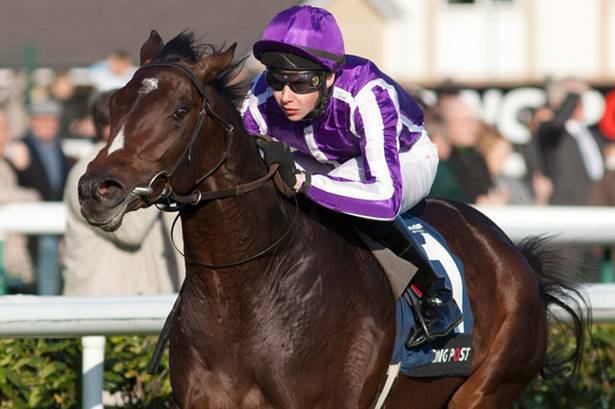 Well this is what the flat aficionados have been waiting for with the first Classic of the season upon us with the Qipco 2,000 Guineas at Newmarket where we have a red-hot favourite in the form of Aidan O'Brien's Camelot. Clearly Camelot deserves all the respect in the world with top connections & a very visually impressive win in a top two year old trial when taking the Racing Post Trophy over the same distance at Doncaster in just his second ever race. We have a feeling that the current odds being offered (7/4 tops right now but 5/4 elsewhere) can't really be justified though, this is no Frankel (went off 1/2 last year) & the horses in behind that day at Doncaster weren't necessarily world beaters. It was a small field of just 5 runners, the runner up had only won it's maiden before running in behind in two Group 3's, one rival was a stablemate, the horse finishing last was having it's 7th run of the year & although having won a Group 3 had also already finished stone last in the 9 runner Group 1 Goffs National. We did like the horse that finished 3rd, Fencing who is a rival today but also have a sneaking suspicion that Gosden's charge might be a tricky one to win with as he looks a horse with just one potent thrust & 7 furlongs might suit better. All of that being said Camelot did beat them all easily enough & soft ground at Newmarket shouldn't be a problem pedigree wise with Montjeus tending to like give, it might also help make this a bit more of a stamina test & that should suit as Montjeu really has a very poor record with milers & that also tempers enthusiasm at the likely odds. We've seen it so many times before where a fancied horse gets placed here before going on to glory at Epsom in the Derby & we think that could be the case once again with Camelot who could find one or two better suited to the mile here. We want things in our favour when betting & here there are a lot of unknowns with so many horses yet to race this season & prove they've trained on, plus many haven't encountered soft ground either, therefore we're happy to take a chance on Caspar Netscher whose win in the Greenham at Newbury a couple of weeks back entitles him to respect. It isn't just this year's win but also last year's form that is worthy of consideration, with Group 2 wins in the Gimcrack & Mill Reef stakes, they were both wins over 6 furlongs & the Greenham was over 7 & he looks quick enough but might just be able to last it out here with a bit of cover. Trainer Alan McCabe could seemingly hardly believe his luck to end up with such a good horse & ended up running his star 10 times in his two year old season, including a trip to the states where he started at just 8/1 to win the Breeders Cup Juvenile Turf race. That juvenile campaign should mean he's battle hardened & although unusual for European horses to run that often American trainers like to get plenty of runs into their horses, it doesn't appear to have emptied Caspar Netscher as he looked pretty good on his comeback in the Greenham, putting his rivals to the sword. 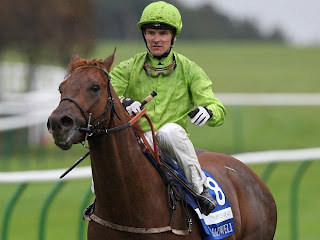 We also think he was unlucky not to add a Group One when slowly away & finding enough trouble in the Middle Park before finishing a close up 5th, slow starts & traffic problems were a recurring theme last year but Newmarket's wide open spaces should help & they must have trained him plenty on the starting by now. At very big odds of 28/1 Caspar Netscher has to be the value each way selection here, he's very quick & stamina could fail coming towards the end but it's worth the risk, at least he's proven himself repeatedly unlike some others at much shorter prices based on pedigree alone (Born To Sea), the French raiders Abtaal & French Fifteen are also worthy of maximum respect. 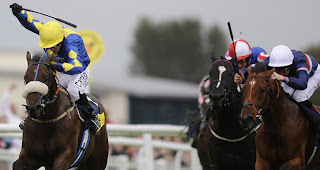 In the 3.45 Group 3 Palace House stakes we're going to go for another Mill Reef winner with Ed Mcmahon's returning Temple Meads, a smart novice who also finished 4th in 2010's Gimcrack. This race is over the minimum distance which tends to be the more traditional route for horses competing in the aforementioned races, rather than the Guineas like Caspar Netscher, Temple Meads showed some real quickness & won his first two races where soft was in the going description plus ran in the Middle Park (again like Caspar Netscher) when it was soft. The Middle Park was a disaster however with the saddle unfortunately slipping soon after the start & ruining his chances, it won't be easy after a break of 18 months but if coming back with the same talent intact then he's a great chance. There are other nice horses in the race with the consistent Hamish McGonagal, Eton rifles & the improving Mayson but they are all short enough & the value lies with Temple Meads with odds of 16/1 available at Ladbrokes who are also offering quarter the odds for each way bets on the race.